KLD Enzyme Mix is a unique blend of Kinase, Ligase and DpnI enzymes. This formulation allows efficient phosphorylation, intramolecular ligation/circularization and template removal in a single 5 minute reaction step at room temperature. This master mix is a component of the Q5 Site-Directed Mutagenesis Kits and it has been designed for use with fragments that have been PCR-amplified by Q5 Hot Start High-Fidelity DNA Polymerase. This kit is designed for rapid and efficient incorporation of insertions, deletions and substitutions into double-stranded plasmid DNA. The first step is an exponential amplification using standard primers and a master mix formulation of Q5 Hot Start High-Fidelity DNA Polymerase. The second step involves incubation with a unique enzyme mix containing a kinase, a ligase and DpnI. Together, these enzymes allow for rapid circularization of the PCR product and removal of the template DNA. The last step is a high-efficiency transformation into chemically competent cells (provided). This product has been designed to be used on dsDNA fragments that have been amplified by Q5 High-Fidelity Polymerase specifically. This product is to serve as a companion product for our Q5 Site-Directed Mutagenesis Kits. For best results, primers should be designed and annealing temperatures calculated using NEBaseChanger, the NEB online primer design software. Is the KLD Mix (NEB#M0554) the same product as the component of the Q5 Site-Directed Mutagenesis Kits (E0554S and E0552S)? What polymerases can be used to amplify the fragments that will be phosphorylated and ligated by the KLD mix? 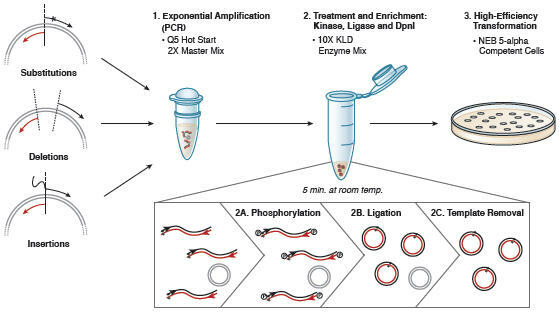 Do I need to purify my PCR-amplified fragments before or after treatment with the KLD mix? Can I use more than 5μl of the KLD reaction to transform E coli? Can the KLD reaction be incubated longer or at higher temperature?